Johann Ambrosius Bach (22 February 1645 – 2 March 1695 [O.S. 20 February]) was a German musician, father to Johann Sebastian Bach. 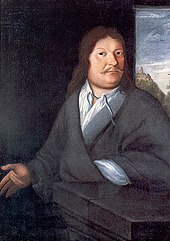 The son of Christoph Bach (1613–1661), Ambrosius was born in Erfurt, Germany, as the twin brother of Johann Christoph Bach (1645–1693). Ambrosius was employed as a violinist in Erfurt. In 1671, he moved his family to Eisenach, in present-day Thuringia, where he was employed as a court trumpeter and director of the town musicians. He married his first wife Maria Elisabeth Lämmerhirt on 1 April 1668, and had eight children by her, four of whom became musicians, including Johann Sebastian Bach, the famous German Baroque composer and musician. She was buried on 3 May 1694. On 27 November 1694 he married Barbara Margaretha, née Keul (she had already been twice widowed). He died in Eisenach less than three months later. After Johann Ambrosius Bach's death, his two children, Johann Jacob Bach and Johann Sebastian Bach, moved in with his eldest son, Johann Christoph Bach. ^ Wolff, Christoph (2000). Johann Sebastian Bach: The Learned Musician. New York: Norton. pp. 16–17. ISBN 0-393-32256-4. ^ Rollberg, Friß (1927). "Johann Ambrosius Bach. Stadtpfeifer zu Eisenach von 1671–1695". Bach-Jahrbuch: 133–152. This article about a German musician is a stub. You can help Wikipedia by expanding it. This page was last edited on 3 December 2018, at 14:40 (UTC).